Paul Cézanne is one of my favourite artists. It is not that I like all of his work: It is more as though he says he is drawing the veil back from the perception of reality, and for that reason I feel close to him and his work. My favourite among Cézanne’s contemporaries is Édouard Manet. By rights I should feel closer to him because he has such a clean eye for what is going on in the world, and I admire his skill as a draughtsman. Still, I feel more emotionally bound to Cézanne. I took this photo at the Met in New York. 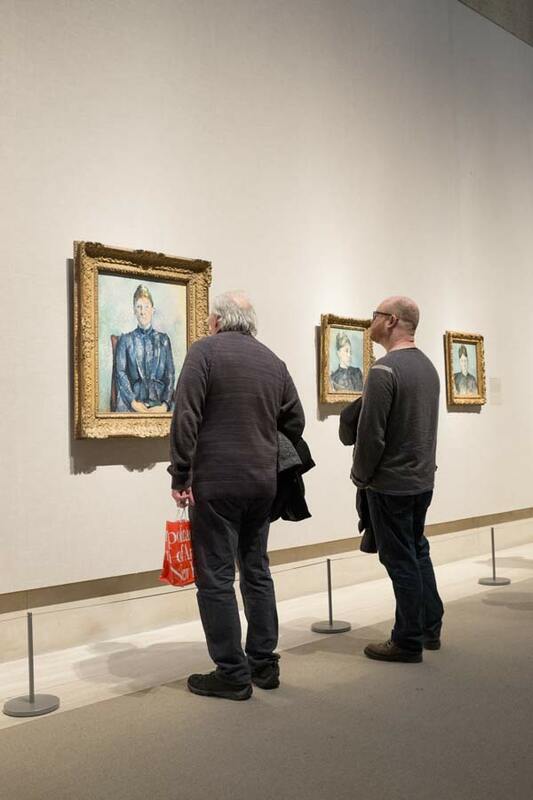 There is currently a small exhibition of Cézanne paintings, all with his wife as the subject. I was sitting down after seeing most of the paintings, when the man with the red bag came into view. I missed a better shot of him when he was just in front of me. I liked the way he has a good peer and the paintings as he progressed. Cézanne met his future wife, Hortense Fiquet, at art school in Paris. She was one of the models and they became lovers. He hid their relationship from his father because he depended on his father for the money to continue painting, and Hortense wasn’t from his social class. He even hid the birth of their son from his father and it wasn’t until some seventeen years after their relationship began that they married. He disinherited Hortense, and on his death everything went to his son. All Hortense got was an allowance to keep her going. So against that background, the paintings in the exhibition take on extra depth. That was a sad ending. Although I wonder did he have much to leave anyway? Yes, it was sad – and I think a lot of his life may have been sad. For a long time he was rejected as a painter even among his fellow painters. Then he became ‘the father’ of modern painting and unlike his fellow painters, he became wealthy after the death of his father, who was a banker.